Combo of two pictures show the logo for Microsoft at their office in Herndon, Virginia, and the entrance of Yahoo headquarters in Sunnyvale, California. A company owned by Microsoft co-founder Paul Allen on Friday blasted Apple, Facebook, Google, YouTube, Yahoo! and others with a patent infringement lawsuit filed in a US court. 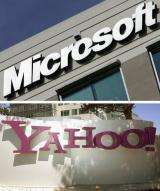 A company owned by Microsoft co-founder Paul Allen on Friday blasted Apple, Facebook, Google, YouTube, Yahoo! and others with a patent infringement lawsuit filed in a US court. "Interval Research was an early, ground-breaking contributor to the development of the Internet economy," said Allen spokesman David Postman. Postman stressed that the technology at issue was created by Interval Research, a company founded by Allen and David Liddle in 1992, and not patents acquired from other firms. "We believe this suit is completely without merit and we will fight it vigorously," Facebook said in response to an AFP inquiry. Google also slammed the lawsuit. "This lawsuit against some of America's most innovative companies reflects an unfortunate trend of people trying to compete in the courtroom instead of the marketplace," a Google spokesman told AFP. "Innovation -- not litigation -- is the way to bring to market the kinds of products and services that benefit millions of people around the world." Patents at issue involved using Web browsers to find information; alerting computer users to items of interest, and an "Attention Manager for occupying the peripheral attention of a person in the vicinity of a display device." TFA is sorely missing information on what exactly is the matter of the litigation. Apparently, they are suing over display of "related" content in thumbnails next to the main content. WSJ's piece is better. you also might like "patent troll"
Paul Allen is parasite on society. He has added so little to innovation but uses the courts to rip off the true innovators. He's probably hoping that these companies will settle out-of-court, in order to make him go away. There is one reason that the NPE ("patent troll") business model has become increasingly popular: it works. It is also legal, and often helps protect independent inventors and SMEs from exploitation of their intellectual property by larger, more powerful entities. Notably, it is almost invariably such multinational corporations that complain most about NPEs -- because, before the latter became so prevalent, greedy corporations could more often infringe SMEs' IP with impunity. Although abuse of the system should be condemned, most so-called trolls do nothing worse than Wall Street traders, for instance. Like it or not, NPEs are here to stay.